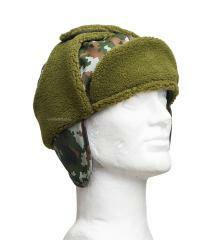 The official cold weather fur hat of the Finnish defence forces, with our own little improvements. Fur hats have very long traditions in the Finnish military it was actually after experiences in the Winter War of 1939 against us Finns that the Soviets adopted their now legendary Ushanka fur hats. A very versatile model, this can be worn in many ways depending on the situation at hand. Not only functional but looks good too, suitable not only for field wear. 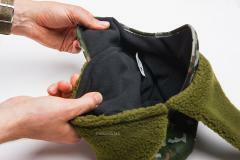 Fold down ear protector with microfleece lining. Fold down fur lined ear and neck flaps for extreme cold protection. The outer fabric (Viking by Carrington) is 70/30 polycotton, the exact same material used in the latest production runs of the official issue uniforms. Naturally the camo print is totally NIR compliant, so you don´t need to fear looking all lit-up when viewed through NVDs. The interior fleece lining and faux fur exterior are 100% polyester. To make sure the fabric does not lose it´s NIR compliant properties we recommend careful wash using only detergents that are free of optical brighteners, basically the more natural you get the better. These are sized in proper old timey fashion according to the exact head circumference of the wearer. In centimetres naturally. If you are a foreign devil: divide it by 2,54 to get the corresponding measurement in inches. If you are in between sizes pick the larger one, for example: head circumference 57,5 cm, choose size 58. 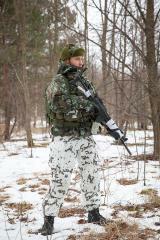 Särmä TST is our own family of specialized military gear. All Särmä TST stuff is made in co-operation with Finnish military manufacturers, the most important thing for us is high quality MILSPEC grade materials and construction. This is kit that you can trust to really take a beating! These are sewn in Estonia, at a factory that has a long history of producing quality clothing for military, law enforcement agencies. Sain tänään karvalakin postista. Yllätyin, miten hyvä ja käytännöllinen lakki on kyseessä. Hattua on helppo muokata sopimaan erilaisiin sääolosuhteisiin. Tämä lakki tulee olemaan kovassa käytössä talven riennoissa. Jälleen kerran laatutavaraa Varustelekasta! Ihan mukavanoloinen lakki, ei mitään muuta huomautettavaa kuin, että vuoraus voisi olla mielestäni paksumpi. Ja sanon mitä moni muukin sanoo, että näitä saisi olla eri värisinä, mustana varsinkin! Ent. panssarimiehenä (nyk. res korpr)kaipaan mustaa versiota. Samaa kaivannevat merivoimissa tai -vartiostossa palvelleet. The material is very thin and not very warm. For the price, I was expecting a much better hat, especially if it is considered "MILSPEC quality". 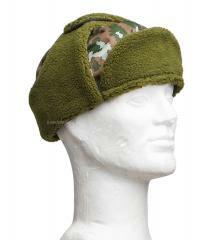 I cannot see any military using this hat for anything other than to stock a gift shop. A standard Korea-style winther hat. Mind that this is not a water-proof shell hat neither a heavy weight Korea-style hat. It will withstand rain and especially snow for a while though. 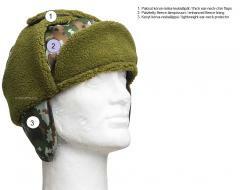 Descently made with descent materials, but do not expect a bomp-proof Korea-style hat like the danish (not sold here). Low weight and low volume. No ones really - unless you expect a heavy weight og bomp-proof Korea-style hat. It is a little to the "flimsy" side. Do not expect 1960's-1980's bomp-proof military grade equipment. My head is approximately size 60. I have this hat in size 60 which is a bit too tight for my liking. If you like a snug fit choose normal head size - otherwise go one size up. For comparison i also have the german BW korea-style hat in size 62 which is comparable to this hat in size 60. About a 100+ weight fleece on the inside, 300+ weight fleece on the underside of the ear flaps and brim. Outer fabric heavy enough for a hat and feels like its coated with a DWR of some sort. It's not Gore tex or anything, but should work fine for snow. Flaps secure with velcro. I have a 24" head and the 63 is a little loose on me. Would be perfect fit with a balaclava under it. Kyseinen karvalakki on kovilla pakkasilla erittäin hyvä, se tuli todistettua viime talvena. Pohjoisesta kun olen kotoisin niin osaan arvostaa lämpöä...pisteet varustelekalle! Pikku pakkasilla menee, kovemmilla varsinkin tuulessa liian ohut. Tietysti jos on liikkeessä niin toimii paremmin, mutta paikoillaan ollessa on vain liian ohut. Huomaa, että on ajateltu vain etelä-Suomen talvea. Tällä lakilla ei ole mitään tekemistä sanan karvalakki kanssa. Todella surkea esitys. Testattu -6 astetta pakkasta, ei kelpaa mihinkään. Päähän jäätyy nopeammin kun konsanaan pipolla. Älä osta tätä ellet aio käyttää plus keleillä! !